I remember the first time I felt like the only one. I was galavanting on a playset, probably at the age of six, when another kid came up to me and asked me why my skin was the color of poop. I don’t remember my response, but I do remember feeling flush with shame and not understanding why. I also remember immediately walking away, as if I knew then what I know now: being the only black person in the room is pretty exhausting. Growing up just outside of Portland, Oregon—a city people often refer to as the “whitest in America”—interactions like that weren’t uncommon experiences for me. For most of my life, I was the only black person in my schools and workplaces. Because of that, I constantly fielded questions about my identity that I often didn’t feel comfortable answering—or even had the language to answer. And I felt a constant responsibility to represent and speak to the experience of women of color everywhere. Between teachers putting pressure on me to lead Black History Month discussions (true story), to remarks about my hair at work—being constantly “othered” became emotionally and mentally exhausting over the years. It’s a common experience and one that adds daily pressure for many people with marginalized identities. There is plenty of research that affirms what I’ve felt for much of my life: Stress isn’t created equal, and being from a marginalized group means there are more factors that compound and contribute to stress. Specifically as a black woman, I’ve learned this elevated stress can lead to a shorter life expectancy, a higher mortality rate for disease, and more—and that’s before even considering how socioeconomic status plays a role, too. We often talk about the importance of representation, particularly in the media and in government. Most recently: We celebrated an unprecedented wave of firsts in Congress with the swearing in of 42 women—some of whom are the first Native American, first Black Muslim, and youngest woman in Congress. But every “first” is often also an “only” in a given space. And when we talk about representation, we so often forget to talk about the emotional stress that comes when we don’t have support from people with shared lived experiences. It’s time to call that feeling of exhaustion that comes from being the only person of a particular identity in an environment what it is: “representation burnout.” It doesn’t just impact women of color like me—it impacts a whole host of people who find themselves to be the “only one” in any given environment. Sometimes, it looks like entering a room and immediately recognizing that you have to do triple the amount of work to be seen as an equal, despite your experience. It may show up in your life when you feel like you need to leave certain parts of yourself out of the room to be taken seriously. Other times, it’s the pressure—either placed on yourself or projected on you—to speak on behalf of a community because you’re the only one in the room. Or sometimes, because of ableism, it’s the frustration of not being able to even get in the room at all. Marie McGwier knows this all too well. As a senior UX researcher in the tech industry who is also genderqueer and non-binary, they know what it’s like to be othered in a work environment. McGwier acknowledges that because of their job and background, they’re more often than not willing to educate people that they’re comfortable around—and they feel lucky to be part of a team that nurtures and respects them. But that doesn’t mean they’re immune from feeling representation burnout. Whether it’s comments and questions from coworkers, holding space as the “only” openly genderqueer and nonbinary person in the office can take a toll. Once you’ve recognized those feelings of pressure, exhaustion, and representation burnout—what do you do from there? 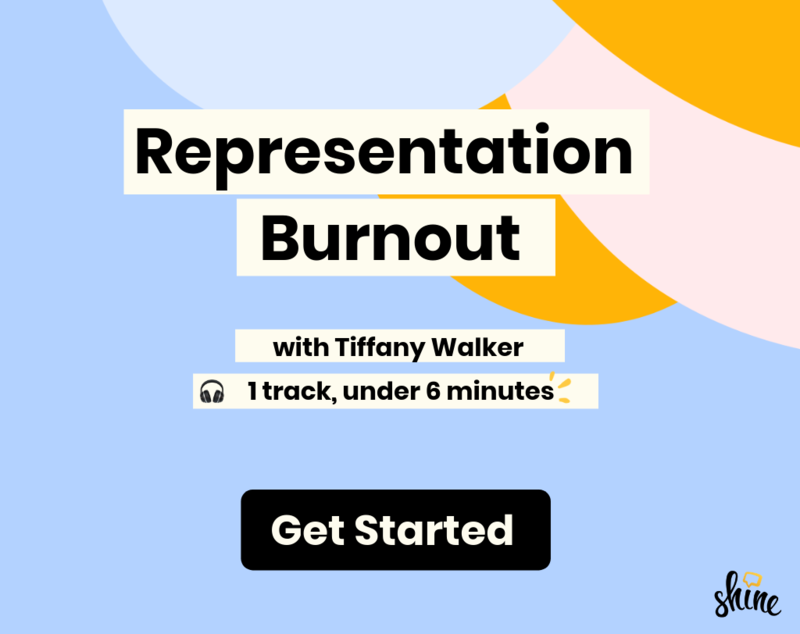 Here are some ways you can start to protect yourself from representation burnout, or ease your way out of it. And if you’re not part of a marginalized group: one way to support is to radically listen—read on. Finding spaces that allow you to be you—wholly, with no hesitation—and with people who have shared lived experiences is important to relieve any tension you might feel building up. I do this by surrounding myself with a community of friends who share being a first-generation person of color with me. It’s a relief to enter spaces with them that don’t require me to explain myself constantly. For McGwier, it was co-creating an organization, If You Want It, a group that supports the fight for gender self-determination and body sovereignty. “One of the big reasons [If You Want It] exists at all is because I needed some kind of outlet to be fully seen and heard in the way which I wanted to be, and I wasn’t necessarily having that in my workplace,” they explained. While it didn’t start specifically for the intent of being seen, as McGwier continued growing a specific project—titled Gender Is Over!—they realized some of their needs were getting met in a new way. Recently, a friend and I were chatting about the “warning signs” we’ve both learned to notice as women in male-dominated spaces. They’re those gut feelings that we’re adjusting our energy for the room, rather than being our full selves. It’s that moment in a meeting when all eyes are on you and someone asks, “What would women think of this?” Or when you hesitate to speak up because your perspective feels different. McGwier has developed their own roster of “warning signs” that alert them that something might take more energy than anticipated. If someone asks them a question and they provide a thorough response, only to be met a week later by another question that sparks the same exact conversation, that’s a red flag. “I mean warning signs in the sense that an interaction with someone may be a little bit more taxing and exhausting to talk about than I necessarily think that I’ll get out of it,” they said. “At some point, how important is it for me for these people to be able to engage with this subject matter if at the end of the day I go home and am not even fully engaging with them as human beings?” they explained. Find your own warning signs by reflecting on past interactions that may have had an impact on your day. What about those conversations stuck with you and stressed you out? Can you delineate which questions require a conversation and which aren’t as important? “If I can answer that question and realize it doesn’t matter that much, that’s when I’m going to draw these boundaries and lines, and that’s how I help myself not be so exhausted,” McGwier says. To them, one way to set boundaries meant disengaging from Slack conversations at work that drained their energy. Setting intentional boundaries can be hard, but starting small can help. I found that sending links to online resources or asking folks within my network to do research before beginning to engage in a conversation with me about race or gender proved to be helpful in terms of preserving the energy I am willing to expend when it comes to educating others. Setting intentional boundaries can be hard, but starting small can help. Honestly: Even gathering PDF documents and having the patience to say “Please use Google!” can take a lot. One way to relieve that burden is to lean on allies to stand up for you when you’re feeling burned out or unable to stand up for yourself. In a similar vein, my best friend and I have a verbal contract: If someone near me is racist or spewing microaggressions my way, he steps into the situation, no questions asked—and I do the same for him if someone is homophobic. Whenever instances like these come up in our friendship, a weight is lifted off my shoulders because I know he’s willing to carry some of it, particularly in moments of high-stress. Being part of a marginalized group means there’s constant bombardment of horrible, oftentimes violent, news. Whether it’s the racist and homophobic attack against Empire actor Jussie Smollett, or the handling of Dr. Christine Blasey Ford’s testimony in 2018, being exposed to that level of trauma constantly can take a toll. In case anyone hasn’t told you today, here’s your reminder: It’s okay to disengage. Unplugging doesn’t mean you don’t care, and tweeting your thoughts isn’t the only way to show you’re passionate about everything from ending violence against queer people of color to women’s reproduction rights. It's hard to imagine a world in which representation burnout doesn’t exist. While it may not go away in our lifetime, taking steps to practice self-care in the face of it is a powerful act of resilence and self-preservation—and you're worth it.